In episode 6 of The BOOM Podcast, speaker and Amazon bestselling author Jeff Yalden welcomes certified personal trainer, health coach and fitness model Lona Sargent. Sargent spoke with Jeff from her home in Delray Beach, Florida, where after some struggles and personal revelations, her career is now thriving. Yalden and Sargent share a connection, a personal trainer and friend named Brian Carl Story, who sadly succumbed to the disease of addiction last year. Sargent met Story after she moved to South Florida and made the decision to seek a personal trainer. Sargent grew up in Maine, and played sports there. When she first came to Delray Beach, she got into a cycle of drinking and the party scene – but realized that she could not continue like that. From day one, Sargent said Story inspired her in so many ways, pushing her in her routine – and the pair became very close. Yalden said he watched Story’s journey from when he got out of rehab to when he was getting really focused, losing weight and shredding. “I was just always inspired by his motivation and determination – and his presence. I followed him, and when he did his fitness competitions, I would send him a video. I just really fell in love with this guy,” he said. When Sargent first started going to LA Fitness, she was still going out and drinking, but she would tell Story about what she was up to. He would constantly tell her that she needed to clean up her act. “He was just a really good friend to have – a great trainer, but he was like my therapist too. I came to him with all my problems and he always had the best advice. It wasn’t just beating around the bush. He told me how it was, and I really respected him for that,” she said. Even though she was doing regular workouts, Yalden suggested that she wasn’t yet ready to bring the BOOM and make immediate change. But Story kept pushing and encouraging her. She never liked hearing it, and because she thought he was just being nice, she didn’t really take it to heart. Story was Sargent’s personal trainer for about a year. Little-by-little, he would confide in her about his own struggles with addiction. “He would just be very honest with me, and I thought the same way I could be honest with him. There is no judgement there ever. That just made me have more respect for him – to see where he was in such a short amount of time. He had come so far – so I really was inspired by him,” she said. The plain fact is that we all have our own struggles and demons to overcome. Yalden is a big believer in transparency – especially in the journey to improvement. After a trip back home to Maine, where she said she went through a couple of traumatic things, Sargent finally had her BOOM moment when she went on a cruise after returning to Florida last summer. On the last day of the cruise, Sargent logged on to Facebook and saw the tragic news that Brian Story had passed away. Lona brought the BOOM and prevailed. She is now someone to watch – an up-and-comer in health coaching and fitness modeling – empowering other women to bring their BOOM. And her future couldn’t be brighter. Listen to the full BOOM Podcast episode HERE. Check out Lona Sargent’s YouTube channel HERE. Grab your copy of BOOM HERE. 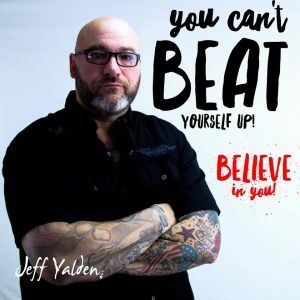 Click HERE to discover more about Jeff Yalden.